Two of The Sound of Music’s most iconic romance scenes - the “Sixteen Going on Seventeen” profession of young love between the stunning Liesl (Charmian Carr) and almost-Nazi Rolfe (Daniel Truhitte), and the long-awaited first kiss between Maria (Julie Andrews) and Captain Von Trapp (Christopher Plummer) - took place in the Von Trapp family gazebo. But shooting both of those scenes was anything but romantic. The “Sixteen Going on Seventeen” scene was the very last filmed for The Sound of Music, and it was almost wrecked by gazebo-induced injury. In Liesl and Rolfe’s number, Liesl dances around on the gazebo benches as the two perform their song. 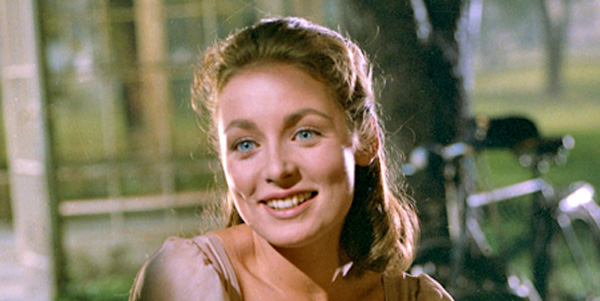 It looks gorgeous and effortless, but that whimsy almost cost Charmian Carr her ankle. The gazebo's benches weren’t decorated with any kind of traction-granting material, and on the very first take, Carr executed her first leap and kept on going straight through the plate glass wall of the gazebo and onto the soundstage floor. She wasn’t badly cut, but her right ankle was sprained. She was given a pain injection by the studio doctor who also applied a bandage, added makeup, and wardrobe added stockings to her costume in an attempt to hide it all. Her one ankle is visibly thicker than the other in the film because of this. Maria and the Captain notably shared a kiss in that same gazebo, at the conclusion of their number “Something Good.” The two had a fit of the giggles every time they sang up close to each other’s faces - the result of a buzzing studio light making fart noises. They actually couldn’t get through the scene. In the film’s final cut, the kiss is done in silhouette, which was director Robert Wise’s solution to the laughter problem. In silhouette, nobody would be able to tell that Andrews and Plummer were chuckling underneath what should be a serious, passionate kiss.